Harkness Screens is the world's leading screen technology company, specialising in providing 2D and 3D screen technologies, innovative solutions and services to the cinema and live events markets. With production facilities on three continents, Harkness is regarded as the premium 2D and 3D screen manufacturer for those seeking to showcase content in an immersive and engaging way. Optimising the cinema screen can significantly improve presentation quality creating better movie-going experiences. Harkness has tools and expertise to help you drive better outcomes from your investments. Investing in premium screen technology can create a more immersive 2D and 3D presentation. From Perlux HiWhite through to Clarus XC, Harkness has a range of technologies designed to show movies as the film-maker intended. Audio and visual presentation quality has a significant impact on the movie-going experience. Harkness has a range of tools to optimise, maintain and remotely monitor presentation to ensure excellence at all times. Driving better outcomes from cinema refurbishment or upgrade projects can reduce risk and cost, save time and improve the utilisation of public spaces. Harkness has a range of services to help you improve your projects. 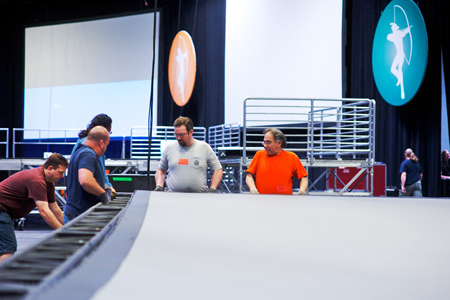 Event organizers and set designers worldwide choose Harkness' leading front and rear projection screens because of their outstanding performance. Harkness' event screen surfaces are engineered and constructed using the highest quality materials and manufacturing processes to ensure an outstanding finish with excellent brightness, colour rendition, and contrast.